Hold the phone T-Mobile fans as our intel from yesterday is outdated almost immediately as new intel points to a Galaxy S III LTE release yesterday. Early yesterday we were advised that the Galaxy S III LTE would be available on June 5th, which is fortunately an outdated piece of information. According to this newly obtained image, T-Mobile has launched the Galaxy S III LTE in T-Mobile retail/branded locations. As for the Samsung Galaxy Exhibit, that remains ready for release on May 29th. The mid-range device features Android 4.1 Jelly Bean, 1GHz dual-core processor with “4G” speeds which likely means no LTE. Also included on board is a 5 megapixel camera and a preloaded media hub app straight from Samsung. 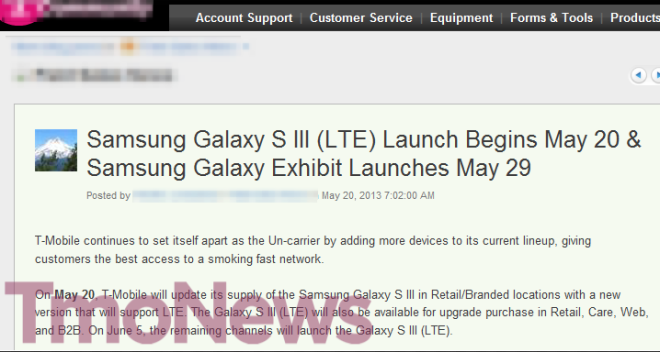 The Galaxy S III LTE will replace the current supply of the Galaxy S III in all T-Mobile company channels. Guess, this is good news. Out with the old in with the new! Does this mean if we need our GS3 replaced for troubleshooting or in case of theft, we’ll get the SGH-T999L instead of the T999? I wold agree with you. Unless they don’t have any refurbished units. They there is a small possibility that they would send out an LTE enabled unit as the replacement. I would assume with the vast number of GS3 sales on T-Mobile there should be a vast number of refurbished devices. Plus where will all that unsellable non LTE GS3 stock go? I’m going to assume replacements for OG GS3s. There is a possibility, but slim at this time, it’ll increase as people purchase/exchange the LTE version. Only time will tell. Maybe the Hspa version will be marked down and marketed toward Monthly 4G people. You mean an S III with an LTE radio in it. Not an LTE enabled unit. The old T-Mobile S III doesn’t have an LTE radio in it. Thus, there would be nothing to enable. Yes sir, you are correct. I worded that wrong. That would be advised…they crack easily. Well, the LTE S3 no longer appears on the TMo web site (it did yesterday), but the non-LTE version is still there. Hope people don’t order the S3 from the web and get stuck with the non-LTE version. Do you have any idea how much that would have cost? Really? not like anyone can really take advantage of the LTE anyway.. I have 2 LTE capable phones in Orlando with no LTE..
i know this topic discussion is about the s3 lte. but what about the 32 or 64 GB s4 version.. c’mon tmo please i will buy the phone cold turkey if need be.. im begging you now! until yall sell the s4 32 and or 64 GB version i will be a simple mobile customer. i have a HTC Amaze with software and internal memory problems and want to become a tmo customer. but not until the 32 or 64 version of the samsung galaxy 4. im seriously thinking of joining AT&T ; they have the 32 GB version. ( maybe next month i will)… but who im I. just one worthless customer. p.s. plz ppl do not comment or recommend a SD card. i already have a 64 GB sandisk on standby. grrrrrrr@ Tmo at&t looks better with each passing day. I can just about buy a S4 for the price that T-Mobile charges for the S3. Is there any reason I wouldn’t spend the extra money and pick up the non branded S4 instead of the T-Mobile S3?